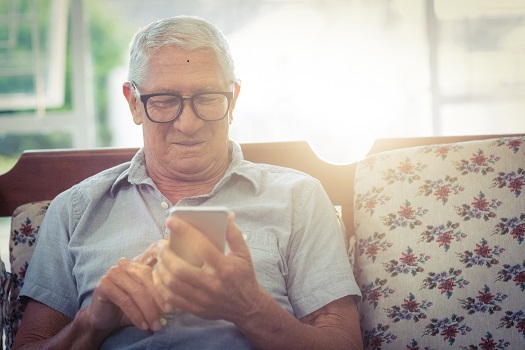 Teaching a senior loved one with dementia how to use a smartphone or tablet might be challenging, but those devices can be incredibly beneficial with the right apps. Software developers from around the world are creating amazing programs for aging adults with dementia, and these apps could have a major impact on your loved one’s quality of life. Here’s a quick glimpse at six great apps for seniors who have dementia. Millions of people have downloaded this app over the last few years, and it’s the perfect option for older adults who would like to boost their brain health. Even though Lumosity requires a yearly subscription, it offers users many engaging games and activities. Some experts believe brain-training games like Lumosity can boost short-term memory, long-term memory, attention span, and logical skills. When it comes to keeping your loved one entertained, you should focus on activities that are both engaging and simple. MyReef 3D Aquarium is a virtual world that lets users interact with dozens of fish in a customized aquarium. Your loved one will be able to spend hours feeding the fish, stocking the aquarium, and listening to relaxing music. Seniors with dementia often need assistance with everyday activities so they can age in place in safety and comfort. If your senior loved one has been diagnosed with a serious condition and needs help with tasks like meal prep, transportation, bathing, and grooming, reach out to Home Care Assistance, a leading provider of home care Edmonton, AB, families can trust. We also offer comprehensive care for seniors with dementia, Alzheimer’s, and Parkinson’s. Engaging in creative activities can boost a senior’s cognitive health and emotional wellbeing. Let’s Create! Pottery is a beautiful app that gives seniors the ability to create digital ceramic items. Users can choose from a variety of different colors, materials, and accent pieces as they build pots and vases from the ground up. This app is free to download, but you can purchase new designs and colors inside the game. MindMate has become one of the most popular apps on the market for seniors with dementia, and it could be an invaluable tool for your loved one. This app has a wide array of features, including brain-training games, a daily planner, workout plans, instructional videos, and a library with thousands of articles. Users can also connect this app to Apple’s HealthKit to track their dietary goals and daily steps. As this disease progresses, you and your loved one are going to need a strong support system. Alzheimer’s Society’s Talking Point Forum is an online support and discussion forum for seniors with dementia and their caregivers. You and your loved one can post questions, join discussions, and read stories from other users who are facing similar challenges. This app is funded and maintained by the Alzheimer’s Society, and it’s completely free to download. Older adults with dementia can live at home safely and optimize their quality of life with the help of highly trained, experienced professional caregivers. If your senior loved one needs professional dementia care, Edmonton, AB, caregivers are available around the clock to provide the high-quality care he or she needs. Using the revolutionary Cognitive Therapeutics Method, dementia caregivers can help your loved one stay mentally engaged and delay the progression of the disease. Spaced retrieval training was developed by a group of medical specialists who were looking for new ways to help seniors with dementia and those who have experienced severe brain injuries. This app uses that training method to boost short-term memory, and it’s a good option for seniors who have mild to moderate dementia. Each session takes only a few minutes to complete, and it can track your loved one’s progress and skills. If your loved one is living with dementia, having a trained professional caregiver close by can provide you and your family with much-needed peace of mind. Not every senior has the same care needs, which means they don’t all need the same type of in-home care. Edmonton families can rely on Home Care Assistance to provide individualized care plans to meet your elderly loved one’s unique care needs. Our holistic Balanced Care Method was designed to help seniors focus on healthy lifestyle habits such as eating nutritious foods, exercising regularly, and maintaining strong social ties, and our Cognitive Therapeutics Method offers mentally stimulating activities that can stave off cognitive decline and delay the onset of dementia. If your loved one needs help with the challenges of aging, call one of our compassionate Care Managers today at (780) 490-7337.